Here are 4 quick tweaks that can improve file access, power options and system performance whether you're on a netbook, notebook or desktop.. Most of the system tweaking I do involves Windows Control Panel, which can be accessed from the Start Menu. The problem is you then have to click several layers deep to find the applet you need. Instead, you can have Control Panel items appear in a menu. Right click on the Start button. Click the Start Menu tab. Look for the Control Panel section. Select Display as a menu radio button. Right-click the Shut down button. 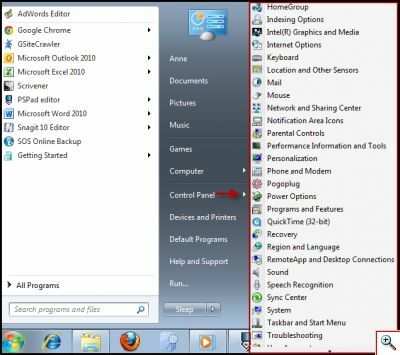 Select the Start Menu tab. Click the Power button action drop down list. Selecting files and folders in laptops and notebooks are really difficult. It was such a pain to select files with the track pad. I liked the checkbox process better and changed my desktop to do the same. Click the Organize button on the top left. Select Folder and search options. Scroll down the bottom of the dialog. Check the box for Use check boxes to select items. Typically, I start by choosing “Let Windows choose what’s best for my computer” and then deselect the items I don’t need. This area is one where you’ll need to play around to suit your needs so don’t go by my custom setting above. Type “performance” in the “Search programs and files” text box. 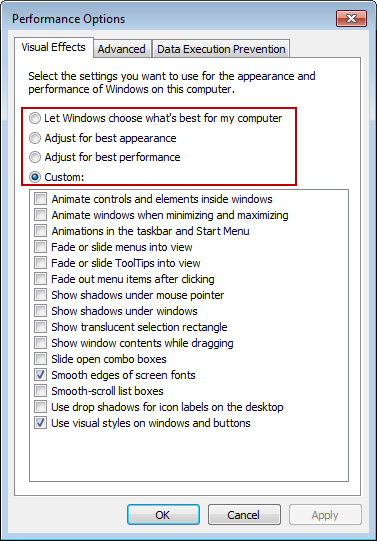 From the results, click “Adjust the appearance and performance of Windows”. In the Performance Options dialog, select the “Visual Effects” tab. Select the radio button for “Let Windows choose what’s best for my computer”. Deselect items you don’t want.